Jonathan Moore and Aaron Mannes make up the members of Ja2M. We have been playing locally for the past 6 years. 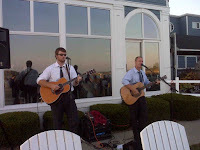 We have recently started playing at a variety of events such as weddings, conferences, and store openings. We are a Connecticut based duo. We can fit to any event with ease. Go to our "The Music" tab to hear our sound! JA2M Connecticut Guitar Duo (c) JA2M 2011. Header Image by Anna Sawin Photography. Powered by Blogger.